Description: A journeyman central defender, the Basque-born Artiz has played for a raft of clubs in Europe, as well as a stint for Muangthong United in Thailand. His first season for the Wanderers was dreadful, being sent off on debut, and giving away multiple penalties and being generally an awful defender. honestly though t the only way this guy is getting a second page is if he left us. 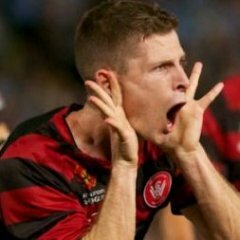 Borda video with all the highlights from his time with WSW. I do wonder if he hired a marketing company to put this together. Looks quite confincing, really. All that's missing are the low lights. Haritz Borda? So we did sign the wrong player!? Worst player ever to wear the red and black. Most of the 2016 pre-season recruitment sins have now been rectified. All we need now is for him to be moved to the ex-players section. FC Goa are now my second team. Clubs are actively on the lookout for quality foreign buys with the domestic signings now complete. Borda, with around 200 appearances in his career that has spanned three continents, will add quality and experience to any ISL side, not least FC Goa." Thank **** for that. Been watching football since 1985 and up there with one of the worst I have seen playing in a team I support, dreadful player, will walk in to any worst WSW starting 11 team for generations to come. I thought about replacing his picture with a trashcan, but he's not worth the effort. Welcome to the ex-players thread! That awkward moment at WSW HQ when no one got the leaving card and cake.......collect your stuff and away you go ..seeya Borda. there you go. sacked on the second page. good enough.